Not all gold in quartz are created equal. It is not uncommon to find pieces of quartz that have very dark iron staining, which does not contrast well with the gold. These specimens are often crushed to extract the gold, as they do not command a premium to mineral collectors. The amount of gold contained within the quartz also makes a difference in the value. Sometimes a chunk of quartz will only show a very small amount of exposed gold. 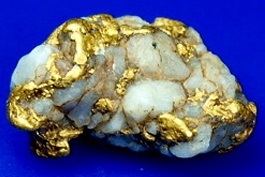 If the exposed gold is the only gold in the specimen, then it may be worth selling as-is, but if there are several ounces hidden underneath the quartz, then it may be difficult to get a premium over the value of the metal. It may be best to crush the quartz to extract the gold, or use hydrofluoric acid (professionals only!) to expose more of the gold within the specimen. With natural gold in quartz, “eye appeal” is what it’s all about. Exceptionally beautiful specimen often command premium prices, just like other types of minerals and gemstones. A natural piece of gold bearing quartz makes the centerpiece of any rare mineral collection.